I’m so excited to tell you about this recipe. 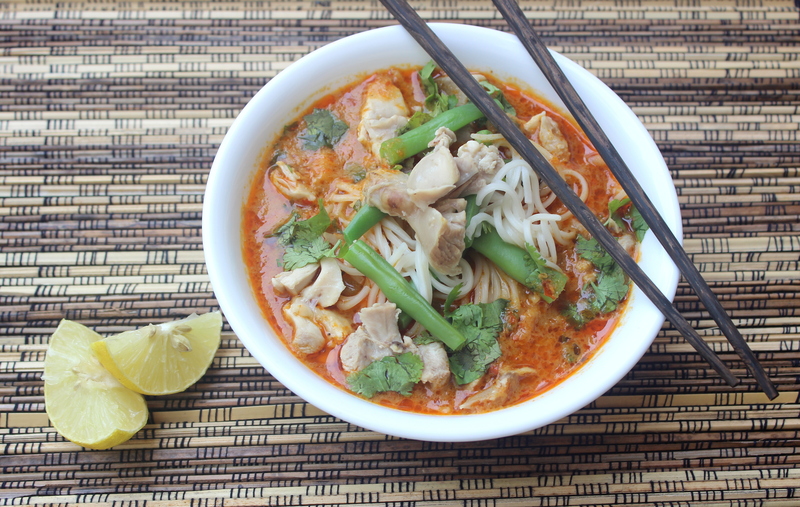 I’ve made this laksa a few times now, tweaking it here and there and adding/omitting ingredients along the way, and I think what I’ve landed up with now pretty much hits the spot, if I do say so myself. If you’ve already taken a quick glance at the list of ingredients, you will have noticed that it does in fact use 10 dried red chillies – it is a hot fiery soup, but one that is tempered down delicately by coconut milk. Even though laksa is technically more Malay/Singaporean and not Thai, maybe because the ingredients of these cuisines lie in a pretty similar ballpark, it takes me right back to the amazing street food stalls of Bangkok! Laksa is usually served with some variation of seafood added to it. Prawn and mussels are my favourite and I would’ve gladly used them here if it wasn’t for the fact that my husband is allergic to any and all types of crustaceans. So, I improvised with chicken (merely pointing out that you could consider that option as well). If you have some extra time to spare and in need of an upper-body workout, it really helps to use a mortar and pestle to pound the spice paste. I’ve tried it both ways and this really does make a difference – you get to control the exact texture of the mixture and what you end up with is an aromatic full-bodied paste that beats the blender method hands down. I hope you enjoy this bowl of goodness as much as we did! * I like to leave the seeds in as the coconut milk cuts the spice, but de-seed if you prefer. Poach the chicken pieces in 1 litre of boiling water. Once tender and cooled slightly, shred the chicken with your fingers. Transfer the poaching liquid into a bowl and set aside. Bring water to the boil in the same pot and add the noodles and green beans. Once al-dente, drain both together into a colander and run them under cold water. Set aside. Pound all the ingredients listed under the ‘laksa paste’ title in a mortar and pestle, along with the warm water that the chillies have been soaking in (tip : add salt in the beginning – it acts as an abrasive and breaks down the other ingredients more effectively). You could alternatively use a blender to make the paste. Add vegetable oil to a medium-sized pot and tip in the laksa paste. Cook on a medium flame until the oils from the paste start to rise to the top and become aromatic, about 10 minutes. Pour in 2 cups of the chicken poaching liquid and simmer for 5 minutes. Add the coconut milk and let it come to the boil, then simmer for 15 – 20 minutes until slightly reduced. Check the seasoning and add more stock to loosen out the soup if need be. To serve, add the noodles and beans to a bowl and ladle in the soup. Top with shredded chicken, other condiments, and a fresh squeeze of lime. Serve hot. Hi! 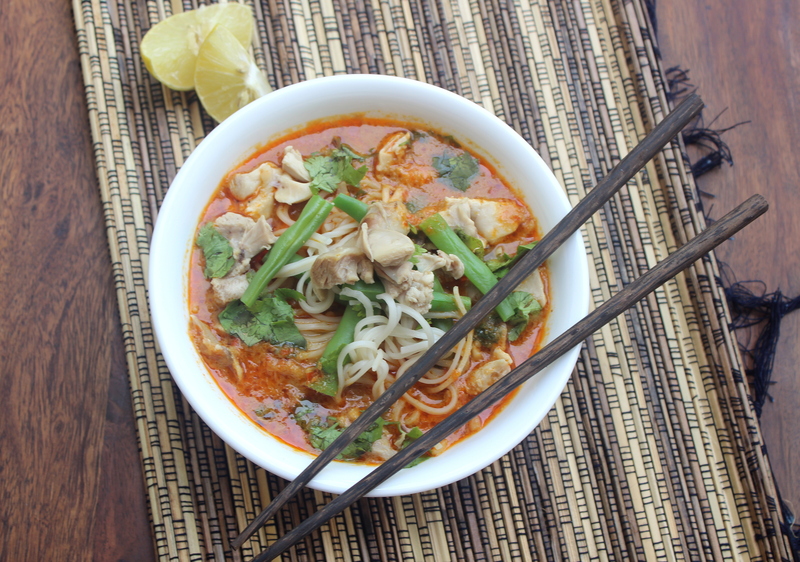 I’ve been looking for a do-able recipe of Laksa everywhere! Yay! This one is one of my favourites – I hope you like it too, Niki! Thank you! This dish has now become a family favourite in our home!